If you’ve spent any time living in a residential area, at some point or another, you’ve probably looked at someone’s yard and thought, “Wow, that looks really well-maintained. I wish I had a yard like that!” The appeal of neatly trimmed, carefully designed yard is hard to explain, but whatever it is, there’s no doubt in our minds that a yard well done is nothing shy of satisfying. At Gainesville Lawnscaping, our goal is to help you plan, design, and maintain a yard that evokes those same impressions. Through our Gainesville lawn care services — including commercial lawn care and residential lawn care — we’ll make sure that your grass is green, mean, and healthy (well, maybe not so much the “mean” part). It’s true that we’re a relatively small team of landscapers in Gainesville, but that means that we provide unparalleled customer service. Owners Blake Roby and William “Buck” Organ have strong ties to the greater Gainesville area and express their passion for the area through their Gainesville landscaping business. 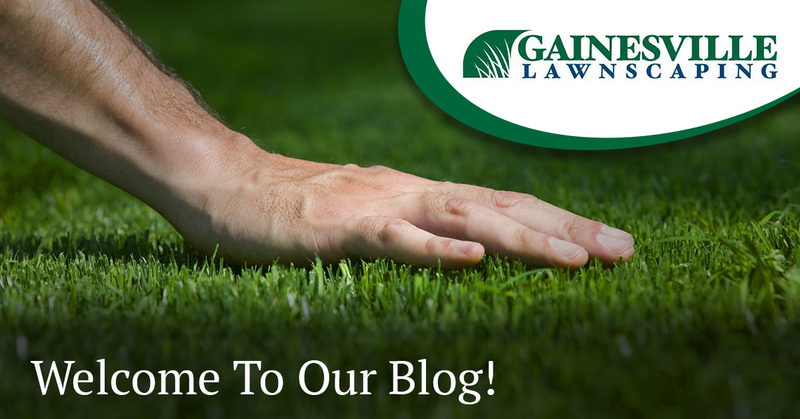 To help welcome readers to our fertilizer-fueled blog posts, we’re going to briefly cover a few of the residential and commercial landscaping services that we offer at Gainesville Lawnscaping. Let’s take a look. The beauty of our residential and commercial lawn care services is that you tell us how much you want to be done. From a full-on full-service lawn care job to a simple “mow and go,” we handle grass mowing, edging, shrub trimming, tree trimming, and more. All grass is worth salvaging if it doesn’t look good. However, sometimes an overhaul is required. That’s why Gainesville Lawnscaping offers sod installation in order to literally lay out a new foundation for your grass. From Bermuda to Bitter Blue Saint Augustine, we’ll help you find a sod type that’s right for you and your house. Mulch is a great cost-effective way to minimize weeds on your property while retaining plant bed moisture. Plus, it’s very visually appealing! Gainesville Lawnscaping offers both dyed and natural mulches. If you have a truly magnificent home, then why settle for a less-than-magnificent yard? Gainesville Lawnscaping is passionate in landscape design, and we want to work with you to create the front and backyard of your dreams. Our designs can be drawn by hand, but we can also render your design with a 3D modeling program. If your sprinklers aren’t working properly, then your grass isn’t going to fare well in the hot Florida sun. From irrigation repair in Gainesville to full-on sprinkler installation, we’ll make sure that your grass is getting the watering that it needs. Your Yard Is In Good Hands With Gainesville Lawnscaping! If it’s related to the exterior beauty of your home or business, then we want to help. With other services including hardscaping, pressure washing, property cleanups and more, we do it all. Thanks for stopping by, and feel free to contact Gainesville Lawnscaping to get a free quote on any of our services.